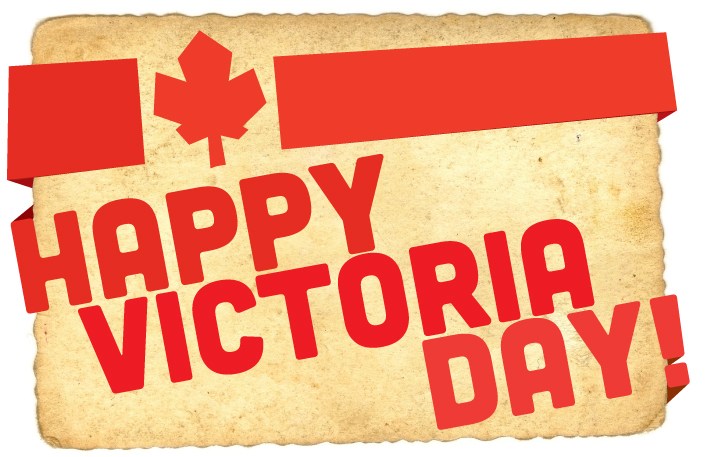 For many in Canada the Victoria Day long weekend (or commonly called the May Two-Four weekend) is the time to head north to open the cottage. This weekend is so special because after a long winter the weather is warming up. People might even be found walking around in shorts and a t-shirt. 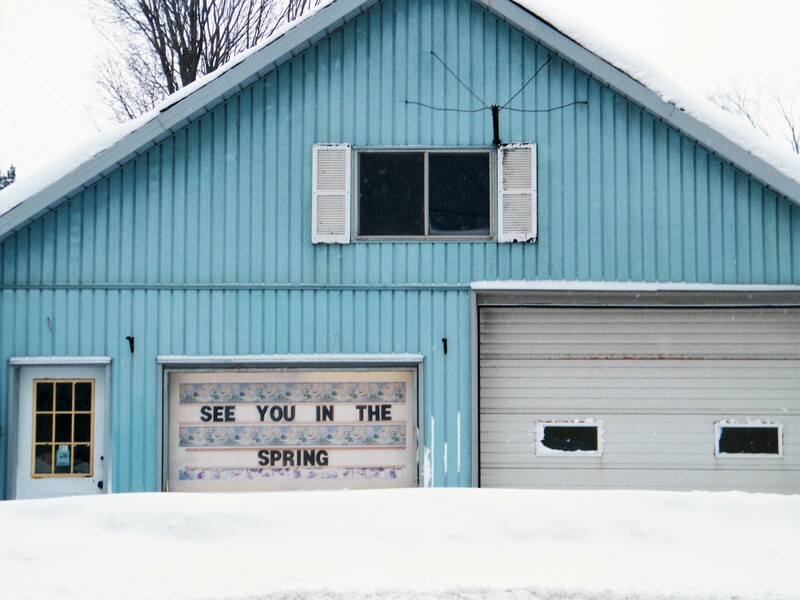 For many that weekend was the “unofficial” beginning to summer. Barbeques are fired up, campfires are enjoyed in the late evening and some people even have fireworks. For the gardener the “rule of thumb” in the area where I live, is the May two-four weekend is the time to plant your garden. The one difference between a typical bike shop and this shop is the work involved before it is even open for business each day. 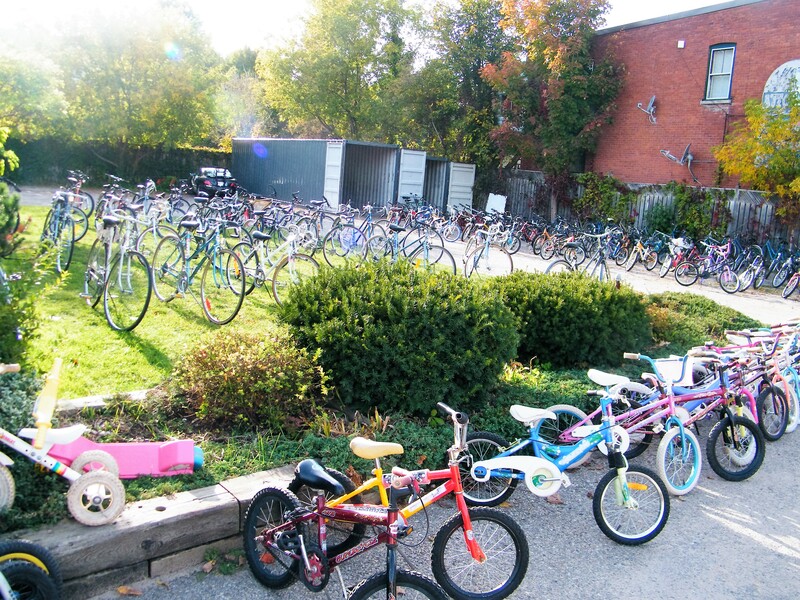 Instead of unlocking the door and turning lights on and you are open for business, every morning at Rolly’s shop involves taking well over 100 bikes of all shapes and sizes out of a storage trailer and setting them up. It will take two people steadily working about an hour to get them ready for the day. At the end of the day everything is reversed and the bikes are put away in storage. Once again it will take around an hour for two people to work steadily. A portion of the selection of the many bikes set up for display for the customer each day. Notice the trailers in the back where the bikes are stored for the night. I have been involved with the setting up and particularly the putting away of these bikes probably hundreds of times. I did it regularly for two years that I did not have steady employment and now often after getting home from my regular job I would tell my wife “I’m going up to the bike shop to help put bikes away”. After a stressful day at work, this was stress free for me. A lot of laughs and joking around. People are always amazed of the work that is involved with setting up every bike he has reconditioned ready for sale on the lot, and then putting them away at the end of the day. But Rolly really wants the best selection for his customers, thus every bike is set up. And what a selection. It starts from the small kid’s bikes with training wheels and up to adult full suspension mountain bikes. There are road bikes, stunt bikes, folding bikes, commuter bikes and often specialty bikes such as tandems, adult trikes and unicycles. And people will drive long distances to check out the selection of classics that go back over a half a century. Along with those classics there are the parts in stock for those classics, often extremely hard to find anywhere. 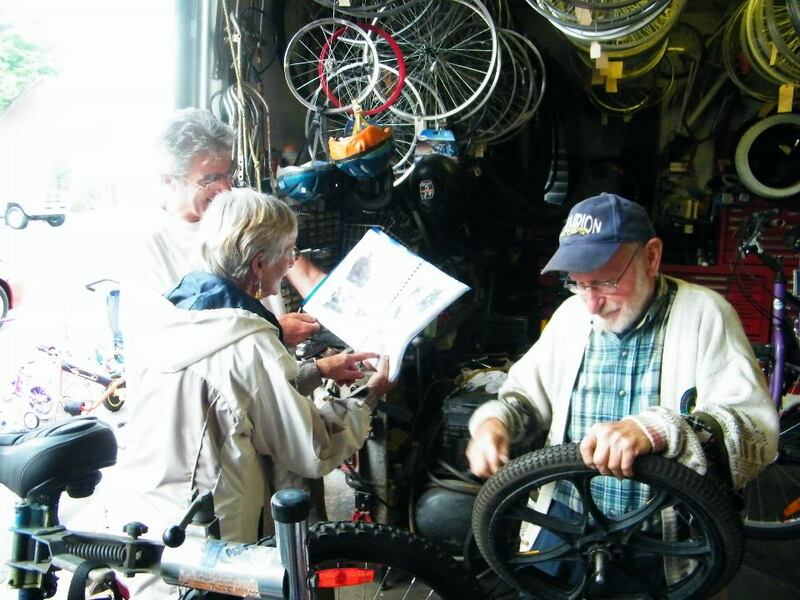 And sometimes city shops will refer customers who come in to a have a vintage bike serviced to Rolly because of his parts inventory, and his knowledge and expertise with these particular bikes. Rolly posing with Jean Beliveau the World Wide Walker. Lots of parts in this shop, many of them hard to find. The shop has been featured several times in newspapers and on television both on the news and on a roadshow documentary. One of the greatest joys a few years back for me was to introduce Jean Beliveau (the world wide walker) to Rolly and his lovely wife Grace. 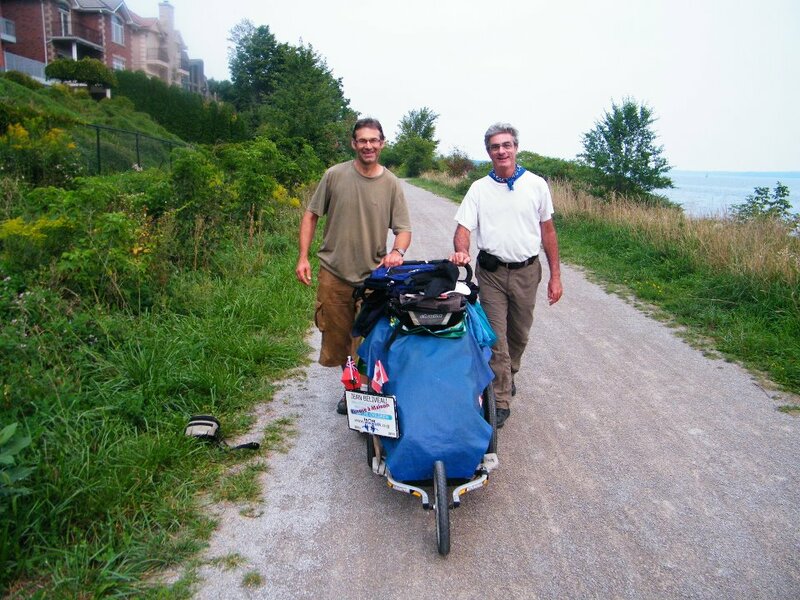 I met up with Jean in Orillia while he was on the final leg of his 75,000k 11 year non stop walk around the world. When I met Jean to pick him up, the 1st thing I noticed was the tires on his trailer. They were bald. I said, “Jean your tires are bald” Jean acknowledged what I said, but did not say anything else. These bald tires made it on Jean’s trailer to where I met him in Orillia. But I knew someone who would drop everything to keep Jean’s journey moving ahead. Our family had a wonderful overnight visit with Jean, and the 1st thing after a hearty breakfast made by my dear wife was to get up to the bike shop for some new tires. I offered to pay for them, but Rolly would not hear of it. And he even installed brand new tubes with the tires. Rolly installing a new tire along with new tubes for Jean Beliveau. 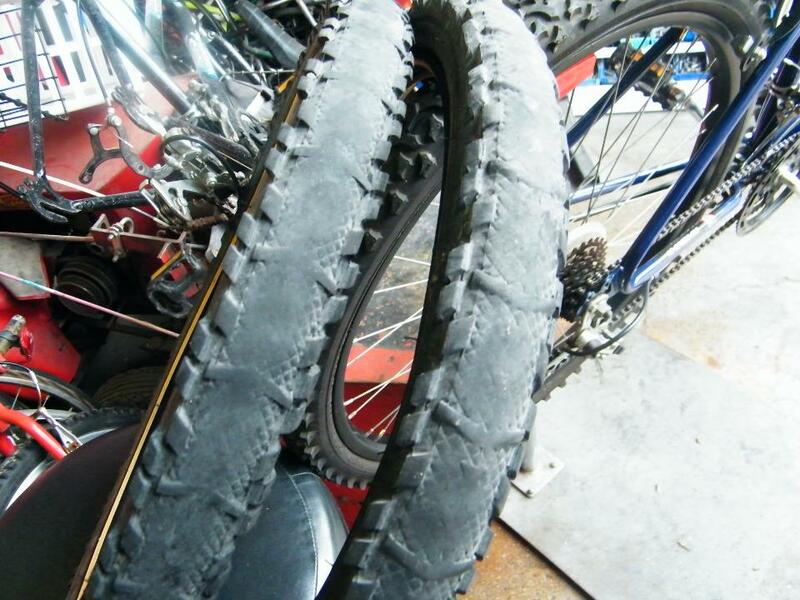 This would be the 17th set of tires on Jean’s epic 75, 543 kilometer worldwide journey. Jean is showing Rolly’s lovely wife Grace some pictures from his 11 year expedition. If no one is able to help Rolly set up or put away bikes, Grace would be the one pitching in those days. After the tires were installed it was back to Orillia to the exact spot where I picked up Jean the previous day. I then drove to Barrie, parked the car and walked back to meet Jean half way and we walked together for 15 kilometers to the place where Jean was to spend his next night. It was such an amazing time to spend that time with Jean. More information on Jean Beliveau and his 11 year non stop 75,543 km expedition can be found on his website World Wide Walk. Such a tremendous day walking with Jean. Those new tires would bring him home on the final leg of his world journey to Montreal after 11 years on the road through 64 countries. A huge celebration was organized for Jean’s arrival home to Montreal. 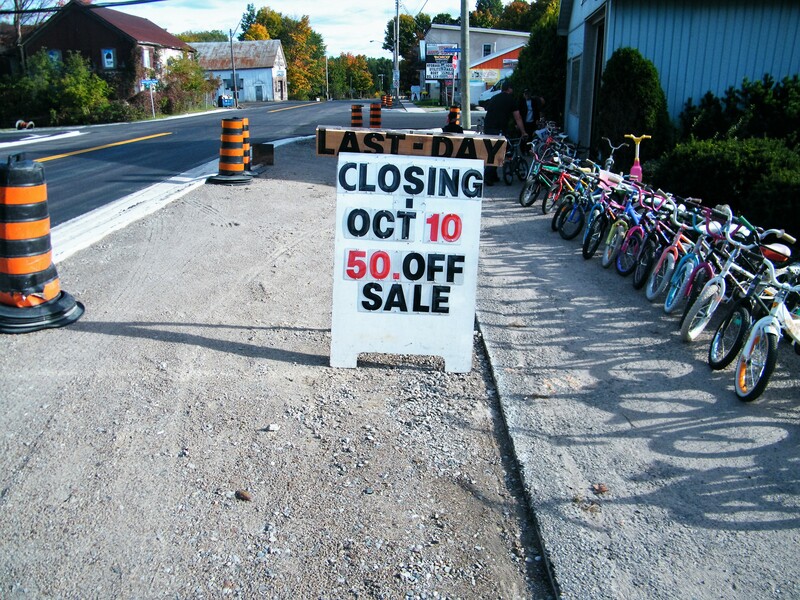 Every October there is the typical “Closing for the Season” at the bike shop. Winter is coming, the weather is cooling down, and not many people are interested in another bike this time of year. But this past October there was a subtle word difference. This time there was no “Closing for the Season”. Instead it read “Last day”. No one really picked upon the word change, which is what Rolly would have wanted. Rolly has never been one for fanfare, and was happy there was not any of the hype. After much coaxing from his wife, Rolly has re-retired from what was his bike shop business in his retirement, and has packed away his tools. After over 20 years of seeing all those bikes carefully set up for display, people heading north this spring are noticing that “There is Something Missing”. Some are even coming into the post office to make inquiries. There will never be a bike shop as unique and special as this one. Thank you Rolly and Grace for serving our community over your lifetime. Not only with the amazing bike shop, but before that as a used car dealer, before that a body shop, before that a second hand shop and before that an antique shop! And even though sustainability and recycling have become buzz words nowadays, Rolly and Grace have been doing this for decades. In a throw away society, probably a few thousand reconditioned bicycles were kept out of the landfill through Rolly and Grace’s efforts. Carl, what a fascinating story. It never ceases to amaze me when I read about the interesting people you’ve met and experiences you’ve had. You describe them in such vivid detail. Rolly and Grace sound like such wonderful people. And Jean is pretty impressive, too! Thanks for sharing your unique experiences and perspective. Thanks so much for stopping by Kim and for taking the time to read and share. Yes, I am very truly fortunate to have met and known some very incredible people. It does make one’s life so much richer. I got to meet Jean for a mere 2 days, which went by so fast, but I still touch base with him as his wife from time to time. I have known Rolly and Grace for over 20 years. They are so interesting and I almost take them for granted. It is only when I hear others speak of them, that I feel how honoured it is to have known them so well for so long! What a cool story. That’s so neat he reconditioned all those bikes. So true that we’ve become a throwaway society. Very cool what he did. I’m sure those kids will enjoy all those bikes!! Always appreciate you dropping in and for all your support Angie. It feels so strange not having the bike shop around this year where I often putter around and hang out. What a wonderful part of your community. I am sure it is bittersweet to see the bikes retired (unintentional pun there), it is so wonderful that Rolly & Grace were able to make your part of the world (and somewhere on the other side of the world) a better place. All those bikes were such a landmark that did put this little village on the map. Always loved seeing the families with little children come in, and the children taking the bikes out for test rides, and going home so excited with their new bikes. That same excitement will indeed be experienced on the other side of the world. So cool to think for some it would riding a bike for the very 1st time. I am so glad that they will still be in your life. Something tells me that they are the sort of people who may be retired, but will still be a big part of making life in your town special. What a wonderful legacy from a committed, generous community member. 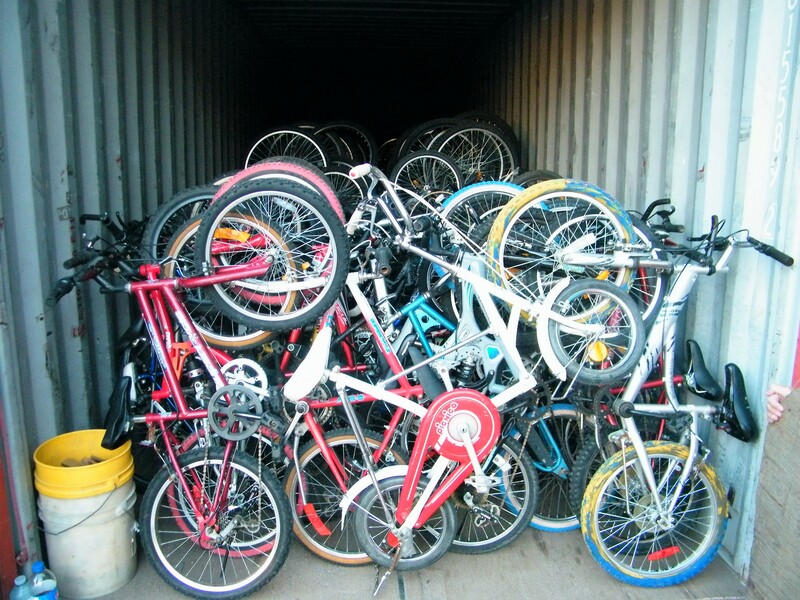 I just love the fact the the unsold bikes were sent to the Ukraine. A beautiful post, Carl! Thank you so much for reading and your kind words Terri. I do love the fact the unsold bikes went to the orphanage.in the Ukraine. I moved to Hillsdale 21 years ago just before the bike shop opened. In that same building Rolly was operating a used car dealer. Always been a major part of the community. Originally in pioneer days the building was a blacksmith shop. The shop would have been a treasure trove for every child and adult alike! Those images of the bicycles neatly lined up filled me with such joy 🙂 A wonderful gesture to send the remaining bicycles to the orphanage – they truly know the importance of giving back. It is a sign right, of a life lived so well? Thank you so much for sharing their story 🙂 Hope they are enjoying their retirement and making the most of the summer. Great story! I need that shop! Aww, so sweet. Best wishes to Rolly and I hope he has a happy retirement! Thanks for stopping by and sharing Fleck. Hopefully Rolly and Grace get to see and do all the things they hope to in their retirement. Lovely post, Carl! 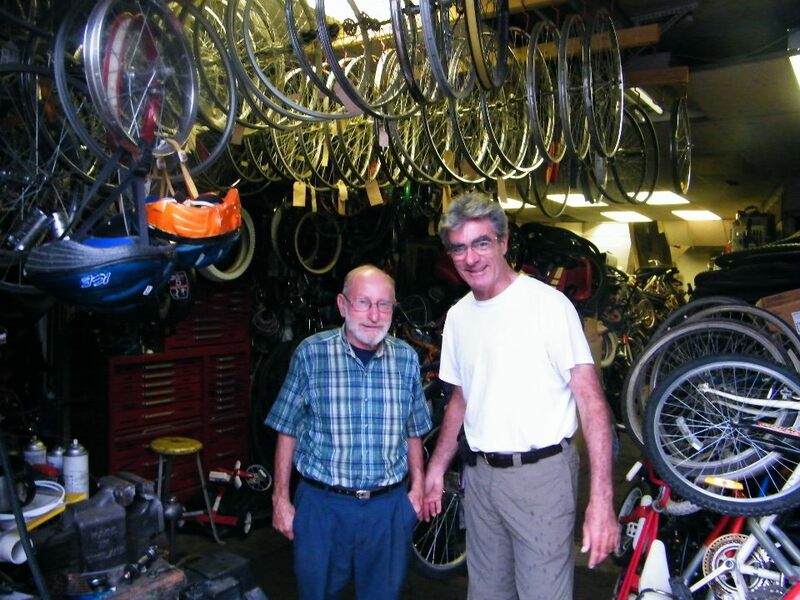 The bike shop and the owners sound amazing and while it’s sad that they’ve closed, I’m happy that Rolly and Grace will get to enjoy retirement. I wonder what they’re doing with their days now since it seems like they have a passion for running these small shops. Hope you’re well! Jhaneel, how wonderful to have you drop by I am keeping well, hope all is well with yourself. It is always nice to still have your health going into retirement. I know Rolly and Grace will still keep busy. They are tremendous gardeners, and I am sure they will be doing some travelling. Rolly and Grace really sum up that Canadian community spirt I read so much about. It always amazes me the Canadian and American spirit of community. In Europe it’s a little different. If I can I try to shop local or small businesses, but more often than not, it’s the supermarket and high street shops. But I’ve noticed in the supermarkets, if you smile, visits often there is a some sort of sense to it. 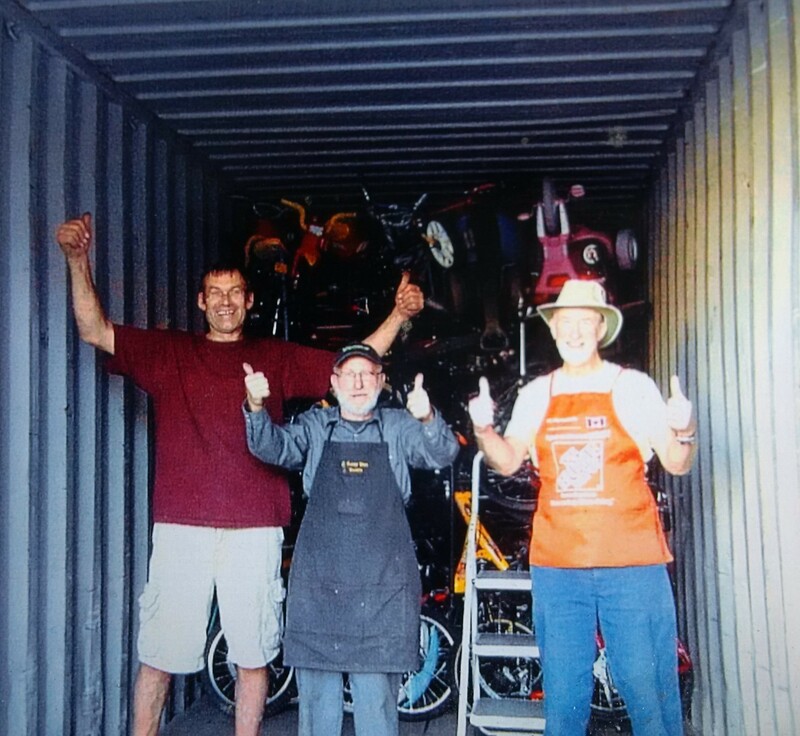 And sending all the bikes to Ukraine made me smile! There is another around the world walker who’s tracing our ancestors path out of Africa funded by National Geographic. I can’t remember his name, but every now and then National Geographic magazine does a check in. I think it’s taking him 3 years or more to walk it. Even through reading your blog Natalie, I can picture you as one who would try and support small, local businesses. It seems often that people that live a simpler, healthier lifestyle tend to do that. We do have the major shopping centres, the supermarkets and the big box stores, but I try to support “the small guy” as much as possible. It was always so nice to have Rolly and Grace’s shop right in my village. We are so car dependent here unfortunately, but I could get my bike serviced right here in my village, which I have been for 20 years. The nearest bike shop now is in the city, which is 25k’s away. The other walker you mentioned got my interest. In my search found out he was Paul Salopek, and his walk is titled “Out of Eden”. I like the description from the website. ” As he traverses the globe from Africa to South America, he is revealing the texture of the lives of people he encounters: the nomads, villagers, traders, farmers, and fishermen who never make the news”. I do my best to shop local, but sometimes it’s internet shopping as it’s there and it’s easy. However the flip side, many small local business now sell via the internet. It’s the same but not the same! I’m truly impressed by the bike shop and Jeans’s epic walkathon. It must be very inspiring to have people with such stamina around. Thank you so much for stopping by Mette. Having these people around really is inspiring for me, both in my running and in my life. What a special store. I really enjoyed all of the pictures with your post. It really was a special store. I do miss having it around, but I have great memories. Thank you for taking the time to drop by and read and share! What an amazing story! I would have missed it had you not been over to visit. I love your photos and the story they tell. And a happy ending to boot! I imagine so many happy Ukranian people riding bikes sent with the love. What better gift than love? Thank you so Michelle for stopping by. Wonderful to have you here. Every time I see the empty bike shop, I do think of those happy Ukrainian people riding around, and it puts a smile on my face. Thank you so much Tricia for stopping by to read and share your generous comment. It has been so wonderful to have this shop over the years. There was always that personal touch, and as you aptly described that “service with a smile”. Always something to be said about those small local shops where the only advertising there is, is word of mouth. Wow, very cool pix. Sounds like a very special communal place. On a related tangent…what I wouldn’t give to be able to plunge my head into that snow. 114 degrees today in inland CA. We were melting. Tmrw will be only 98. That is so hot. I can’t get my mind around that temperature. That snowbank really would be refreshing. The hottest I have ever experienced was Death Valley 30 years ago when I drove through with a friend. It was early May, and I think it was 101 degrees. Haha… yeah for real. We were coming off a Canadian winter, and 101 degrees was so unbelievably hot. Still can’t imagine 114 degrees. I would send some snow down if I could, but it is now all melted. And sad – but you are so right about the throw it away culture ! I once had to explain to students what a shoe repair man was – they were surprised as they always threw away used shoes and well – truly A different day and age. Lastly – the 11 year walk ? Holy cow is that amazing – and cool that you were able to join him and get those tires relaxed (( with the sweet bike man))…. It is such a different day and age. This throw away culture is so sad, as it continues to keep you buying new instead of repairing It is very interesting, the people who lived through The Great Depression like my grandmother made things last. Even though she could have very easily bought new socks, she kept darning her socks with holes in them right to the year she died at 87. Well 9 hours is reasonable – but still so far! When we moved in Florida – it was three hours to see our cousins – only three – but we inky went a few times ! Because three hours was still a big chunk – and 9 is even more. 😉 it reminds me of when I worked in this restaurant in the 90s – I did it part-time so I could stay home with my son- and a few of the days were so tough because I felt like “I went to college for this?” – but years later I saw the gift – the gift of the fun and the cool down to earth colleagues – but also the benefit of the hard work – we had four floors in an old historic building and it kept me so fit – strong! God rocks – and I love how so often he directs with circumstances dictating what ends up being a health gift! Carrying trays and stuff too – we had food runners – but much labor – I moved into upper management and that was a huge gift ((actually changed my life – )) anyhow – I was super fit – but it was actually these last few years when I my posture started getting to where I want it – and for this I thank yoga – wonderful yoga! Core strength – ! I do like to run – but will never do what you mega runners do – oh my! It’s a gift you all have…. Haha, I’m just an ordinary runner, just like everyone else who runs. I bet you would do AMAZING! Getting out in God’s creation on the trails you just go further. But when i found the right teachers and type – wow – just what I needed – (writing all this from my recumbent bike (old but study and good) – ha! Good weekend to you C! Wow! What a beautiful post! Thanks for sharing this wonderful story. The writing is lovely, and the pictures are fantastic. Very interesting read. Thanks so much for stopping by and taking the time to read. It is great to connect. This was great….You’ve really got a nice talent, Carl, for sharing a story….Your style is straight-on, real, and – do we use the word “wholesome” anymore? We should…..You know, in my shed, I still have my Fuji Sports 10 that my Dad bought me in 1980. On another matter, I looked at the Run for the Toad, based on your other blog installment; alas, it is too close to a marathon that I am scheduled to do…..the Loch Ness Marathon in Scotland during the weekend prior! Best wishes to you! Yeah we really should use the word “wholesome”. I love those vintage bikes like your Fugi. Running a bike shop like Rollie had is a retirement project I would love to do.